2017 Powell River Books posts. 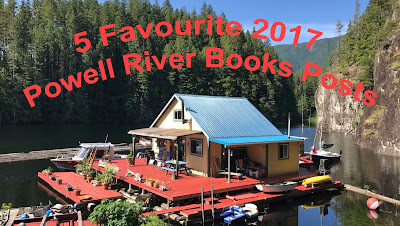 My Powell River Books blog is where I share posts about off-the-grid float cabin living. Looking back at 2017, here are some of the most popular posts. Click each title to read the entire post. Compost Quick -- I have a chicken wire compost barrel where I use put kitchen scraps and garden clippings from spring to fall. Then I bury it in a pit to complete the process over winter. The soil increases the size of my cliffside potato patch. 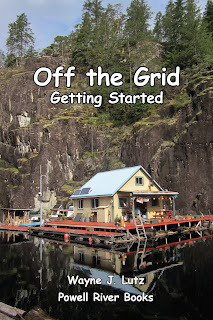 Off the Grid Living -- Wayne and I live away from town and take care of our own utilities with solar, wind and a generator for electricity, hand pump for water, propane for the stove and refrigerator, and a compost toilet. 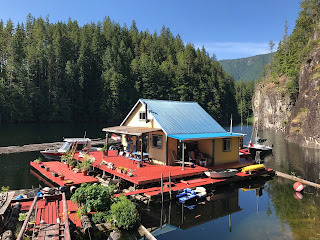 Powell Lake by Barge and Quad -- We use a barge to take our quads on camping trips around Powell Lake. We didn't have a place to store our bikes at the cabin. The barge does that and provides us with a unique means to explore. Stocking Up the Woodpile -- Our Kozi woodstove makes it possible to live off the grid in all seasons. 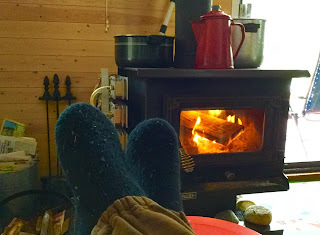 To keep it fed all winter long we have to fill the woodshed in summer and fall. A generator run log splitter sure beats an axe. Homemade Garlic Dill Pickles -- Living off the grid has inspired me to learn new sustainability skills like canning. I put up what I grow in my float garden and deck pots. Wayne loves my homemade dill pickles on his BBQ hamburgers. Heading up the lake tonight. In a red Hewescraft boat. In our cabin on a float. Living in a float cabin is wonderful. Each day brings a new experience, some good, some not so good. Pulling the broken cable and tires from the water. 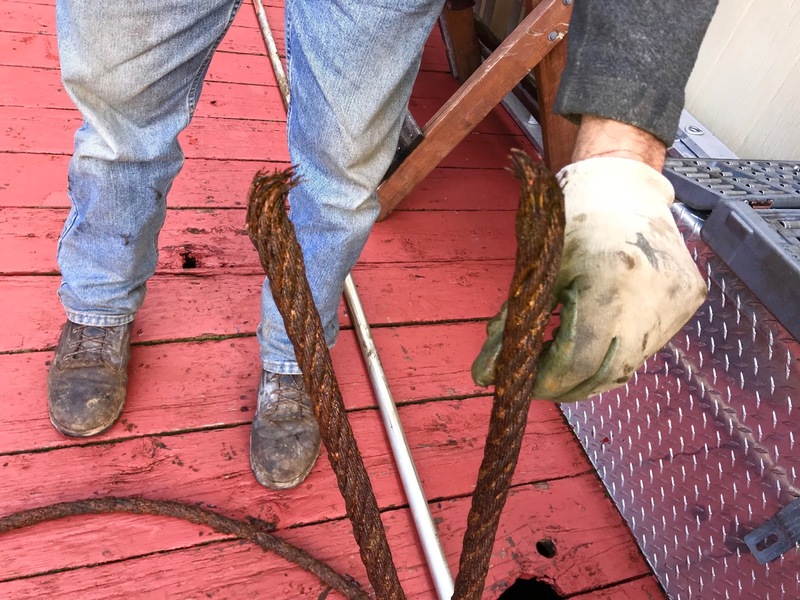 While we were away, a strong November wind storm broke two of our cabin's 3/4" steel anchor cables to shore. One was a back-up cable, but the other was a critical link with tires in the middle used to dampen the cabin's movement during heavy storms. 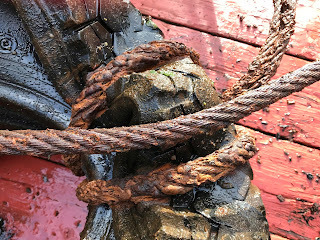 The anchor cable broke at the cliffside connection point. Cables rust over time and wear, especially at connection points. In this case, the cliff end of the cable separated. 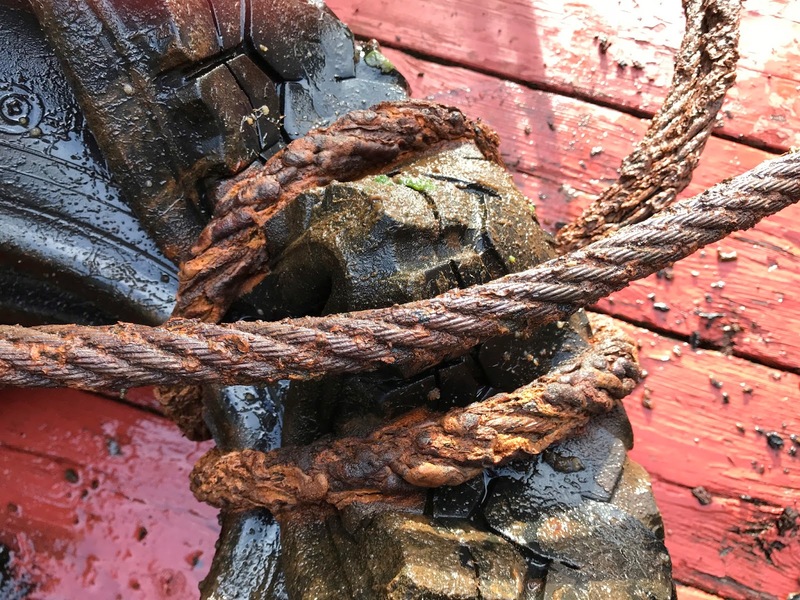 The rusted cable attached to the tire "shock absorber." Wayne and John hauled the broken cable and its steel belted tires up onto the cabin deck for repairs. That took a lot of muscle and a well positioned pipe pole. Grinding through the damaged cable. The only way to remove the damaged cable was to grind if off. Then a new cable was wrapped around the tires and attached with heavy-duty cable clamps. Wrapping the new replacement cable around the tires. The next step was to lower the tires down to lake level. 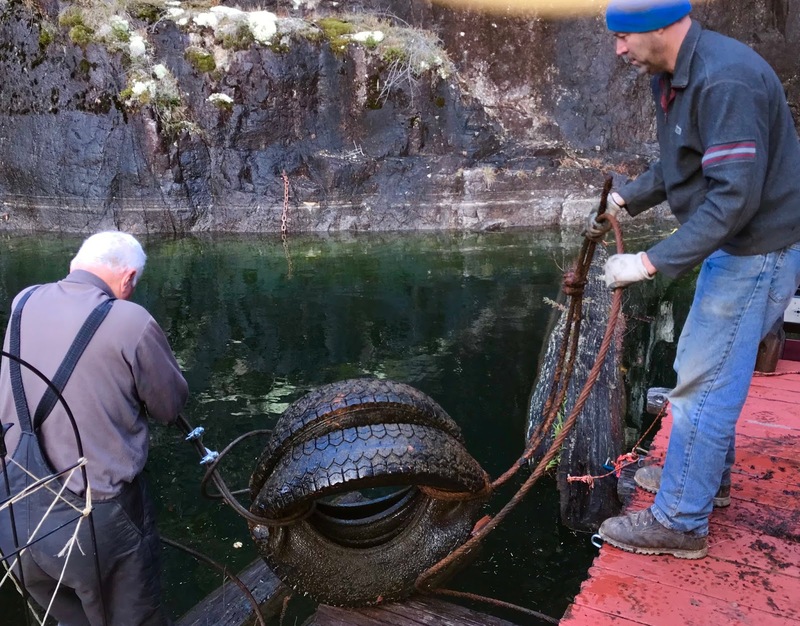 Lowering the tires down to rest on float logs. The tires rested on two float logs while John and Wayne used the tin boat to take the cable out to the cliffside anchor point. 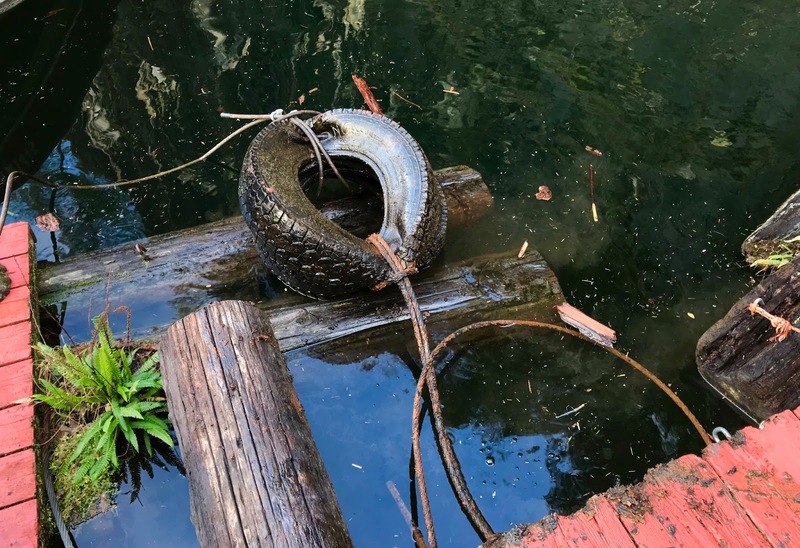 The repaired cable and tires ready for reconnection. 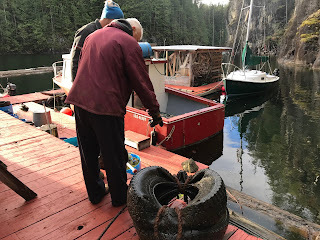 When the connection was complete, John pull the tires back into the water so they could help our float cabin ride out the next windy storm. Here is a video of the tire shock absorber in action. In June the Powell River Garden Club invited Cathy from Mother Nature to give a presentation on fall and winter gardening. It was very timely, because it was the last club meeting of the season and preparation for cold weather gardening needs to begin during summer. 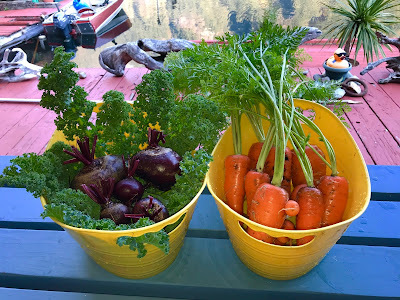 Winter harvest of kale, beets and carrots. I learned that it's not necessary to let your soil rest during winter as long as you replenish it in spring with compost and other essential nutrients. I really like going to Garden Club. I learn new things to make my small garden more productive. Two weeks ago I shared how I'm using covers for containers on my cabin deck to increase the season for greens. Click here to read that post. Here are some additional winter crops I'm growing in my raised bed floating garden. Beets and carrots remaining in the ground. 1. Beets left in the ground. Beets planted spring through mid-summer develop before the cold arrives and will maintain their size. Even with some freezing temperatures, my beets remain in good condition through February. I grow Detroit Red Beets from seed. 3. Kale left growing. My favourite is Dwarf Green Curled Kale. It's compact and grows well in a raised bed. Spring plants last all winter. It tastes even better after the frost arrives. Stems benefit from staking during winter storms. 4. Chard left growing. Like kale, chard planted in spring continues to grow through winter. It's quite tolerant of mild freezing conditions. I like Rhubarb Chard with it's bright red stems and large green leaves. Broccoli, chard and perennial rosemary. 5. Broccoli left growing. Last spring I bought Broccoli sets and the plants have been giving me florets ever since. They're slowing down now, but will have another spring burst before going to seed. 6. Purple Sprouting Broccoli planted mid-summer. A Garden Club member brought seeds to a meeting. I started the them in mid-summer. This variety is taller so I have staked them to withstand winter storms. They will produce in late winter and early spring. Brussels sprouts starting to form. 7. Brussels Sprouts. This is my second year growing Brussels Sprouts. They will produce sprouts from December to February. The variety is compact but benefits from staking. 8. Perennial Herbs. I grow herbs in deck pots and in my floating garden. I cut my mint back and wait for it to come back in spring. You can't keep a good mint down. My thyme, sage and rosemary continue to provide fresh herbs throughout the winter months without covering. 9. Planting Garlic. Fall is a good time to plant garlic. This is my first year trying it. I created space by picking kale and carrots at the end of one of my beds. The garlic cloves will remain in the soil for sprouting in early spring. When it comes time for new garden planning and planting I'll know this area is taken. It's important to get your seeds or seedlings planted early enough to allow them to grow and mature before the first frost arrives in your area. After that, plant growth will slow down. In my area, early August is about the last opportunity to get things going. Another tip is to pick cold tolerant varieties. I have a small floating garden at my cabin (keeps critters away) and one of my crops is carrots. Believe it or not, my root crops and kale last in the ground through winter. When carrots are this plentiful, I substitute them for apples in my Cabin Cake recipe. Yum!! Heat ingredients together in a pan until melted and the raisins plump. Cool before proceeding. Mix the dry ingredients in a bowl and add the cooled wet mixture. Stir until well blended. Add pecans or walnuts (if desired). Pour into a greased and floured 8X4” loaf pan. In addition to greasing, I like to add a piece of parchment paper to the bottom to prevent sticking. Pour the mixed ingredients into the pan. Bake for 25-30 minutes at 350 degrees. Do not over bake because it tends to become dry. When a toothpick comes out clean, it's done. Blend butter and cream cheese. Add powdered sugar and whip by hand until smooth. Mix in vanilla. This recipe make more than enough frosting for a loaf cake. If you don't have all the ingredients for the cream cheese frosting, whipping cream makes a good substitute. 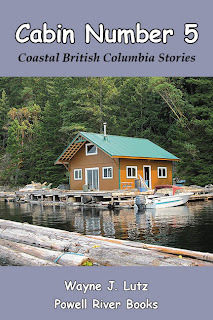 I'm always on the lookout for books by locals, especially those that tell about living in remote locations and off the grid. 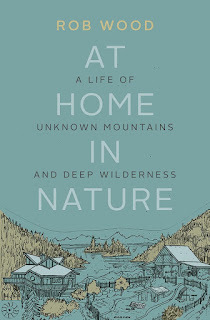 I was recently looking at Facebook and saw a post by Rocky Mountain Books for one that caught my eye, At Home in Nature: A Life of Unknown Mountains and Deep Wilderness by Rob Wood (Rocky Mountain Books, 2017). 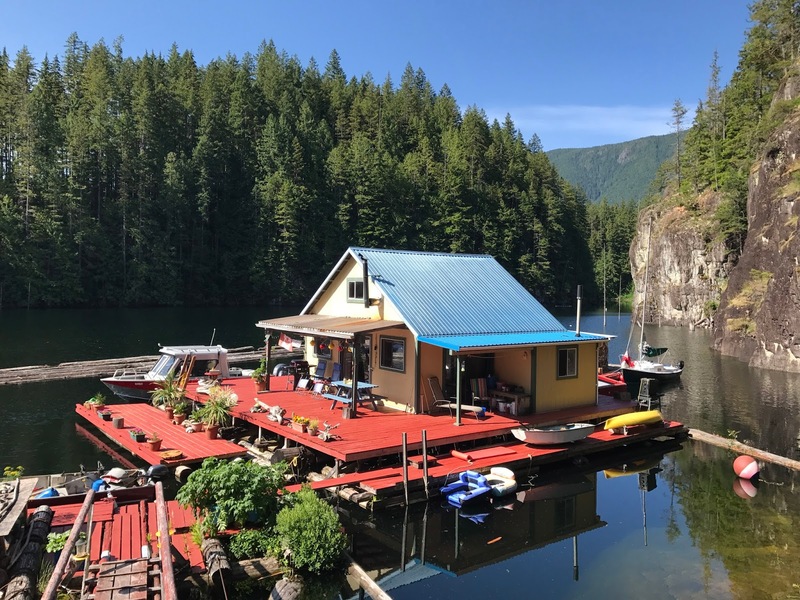 After exciting lives as rock climbers, Rob and his wife Laurie built an off-the-grid home on Maurelle Island between Vancouver Island and the mainland. I especially enjoyed the off the grid living sections of Rob's memoir. 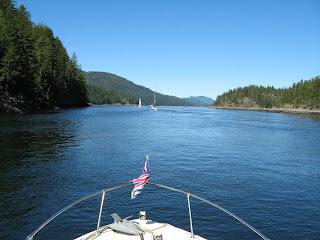 Our boat at Surge Narrows. There's an old saying, "Write what you know." Here's another one, "Read what you know." I enjoyed this book immensely because it made me feel connected. 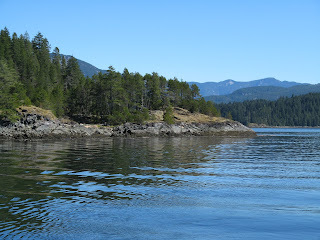 I live off the grid on the mainland side of the Strait of Georgia near Powell River. We've boated through Rob's area including Surge Narrows. 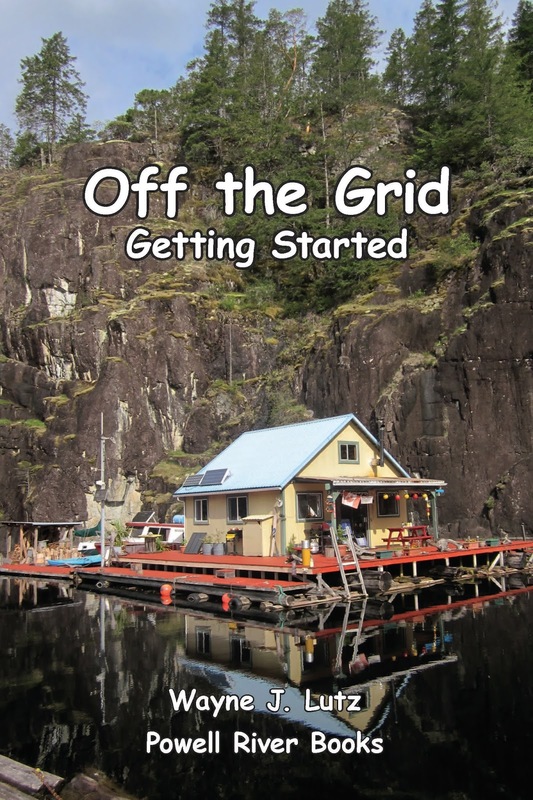 I've also read about the region in off-the-grid books by J. David Cox from nearby Read Island. 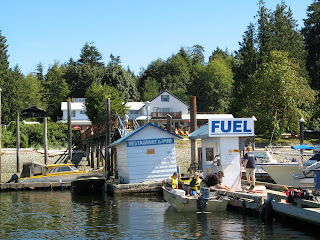 Heriot Bay fuel dock on Quadra. Familiar references piqued my interest. Heriot Bay on neighbouring Quadra Island was a resupply point. 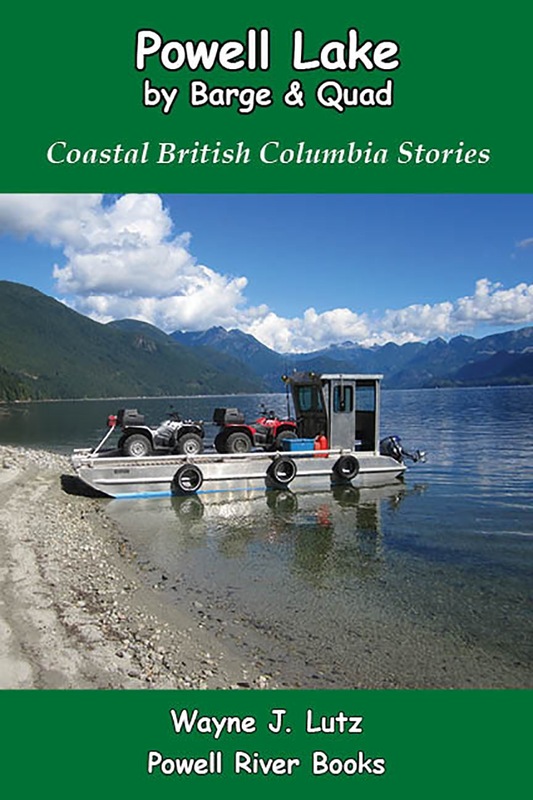 Rob talked about the remote dock on Quadra and the Surge Narrows school and community center mentioned by David Cox in his books and on his blog. I remember seeing the Misty Isles tour boat at Mitlenatch Island, and characters such as Kayak Bill who was an early extreme rock climbing partner of Rob's turned coastal hermit. The drawing on the cover was enticing, but I would have enjoyed a few more pictures to enhance the story. A map of the region would also have been helpful for those not familiar with the area, and people who might want to visit and explore on their own. Passing through Okisollo Channel south of Maurelle Island. I recommend At Home by Nature for anyone who enjoys reading about people who are adventurous and are willing to live life to its fullest. 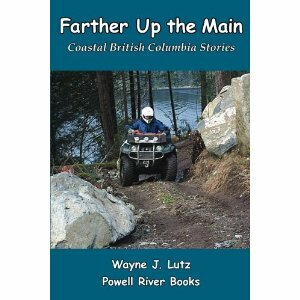 It's also a great book to read if you are coming to visit Coastal BC to become familiar with the people, places and things to do.